Cancer and Libra are badly combined signs. Their elements — water and air, respectively, enter into a contradictory relationship. Cancer is protected by the moon: it gives him sensuality and emotionality, so that his mood can often change. 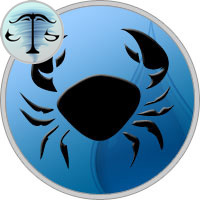 Cancer is timid, distrustful and is looking for a stable, strong partner, under the wing of which you can hide and feel safe. He takes a long time to look at the person and, having considered in him "the very same" defender, clings tightly to him claws, not letting go of his life. Most of the time, Cancer is either in its shell, reflecting on the meaning of life and its place in it. Or in the world of his fantasies, where he builds castles and dreams of an ideal future. The Libra, in turn, is more realistic: it seeks to achieve harmony, while logical thinking prevails over the emotions of the senses. Although he is often not confident in himself, and taking a simple decision sometimes takes a lot of his time and energy. Weights are controlled by the planet Venus, the goddess of love and fertility. She gives her ward the desire for perfect love, as well as the romantic nature. The air sign does not think much about the future and can spend the last money on some beautiful trinket, which obviously does not please the resourceful Cancer. On the other hand, Libra is able to balance the volatile state of a partner and pull it out of depressed states. Both signs are friendly, romantic and have much in common. For example, a family and strong love relationships are a priority for both. Libra assesses the world through the intellect, Cancers — through their sensual side: by pairing, they can perfectly complement each other. The sign of air will learn from the partner sometimes to turn off his head and give himself more to feel, and not just constantly think. And the water element, on the contrary, will more often include the mind and will be more responsible approach to life. Compatibility of Cancer and Libra is at a level slightly above average and is floating. This means that the signs will have to try hard to understand each other and to have an ideal relationship. Their coexistence can also be overshadowed by the fact that both Cancer and Libra belong to the cardinal signs of the zodiac. This means that they always try to achieve what they want, using a variety of techniques. Therefore, between them there will be no one battle before they learn to communicate without conflicts and contradictions. On the other hand, their mutual desire for stability and balance can unite them in a strong tandem. Thus, the horoscope of compatibility of Cancer with Libra does not give a specific forecast: such relationships can be both successful and not so. It will depend on personal horoscopes and natal maps of partners. Compatibility of Cancer and Libra in the work is considered successful, as both signs feel calm in the presence of each other. Such a team has great creative potential and at the same time highly developed intellectual abilities. They will harmoniously fit into any department engaged in creative projects. Harmony and mutual understanding prevail in their cooperation, so they can achieve good results in the common cause. Is Cancer’s good compatibility with Libra in friendship possible? Rather, yes, but for the exact horoscope it is necessary to take into account the position of the other planets. Both are friendly and responsive, they can easily find common interests and pursuits. Tensions can arise where Libra can not remain silent because of its straightforwardness and sharp language and will not say favoritively towards the other. A grieving Cancer takes everything to heart, because it can close in itself for a long time. Of course, the first step to reconciliation will have to be done by a representative of the air element. Compatibility of Cancer and Libra in love is at an average level due to different temperaments. Cancer seeks a soul-mate with a partner, he wants to be one with him and never be separated. Rational Libra appreciates intellectual compatibility: they should be interested in a pair with the chosen one. Feelings are in their second place, because when they subsided partners need to talk about something. Libra are unable to understand the subtle soul organization of Cancer and imbued with sincere feelings. Cancer understands this on an intuitive level. At first, the signs are crazy from each other. In principle, this happens in any other pair. Love and euphoria are doing incredible things with them. This is especially true of Cancer, who is very fond of fantasizing and self-distorting reality in the right direction. Partners seem to each other ideal: exactly those whom they have been waiting for their whole life. But time is running out, the colors are dimming and mutual claims are being replaced by claims from both sides. The level of compatibility of Cancer with Libra in the relationship is reduced. Moreover, Libra begins to compare the partner with other options, to hesitate in his decision, with whom he should stay. They can only be saved by strong mutual feelings. Unlike everyday life, the compatibility of Cancer with Libra in bed is quite favorable. At least, both partners remain satisfied with what happens between them under the cover of night. Cancer outside the bedroom behaves quite cautiously and secretly, which causes in Libra the desire to unravel, accompanied by sexual attraction. Being in bed, the sign of water throws away all veils and behaves very liberated and active. Thanks to his wild imagination, he is able to offer a partner a lot of sexual games. Libra almost always gladly agree to tempting offers of their emotional partner. Their intimate connection is not distinguished by violent activity and animal passion. Both prefer slower, gentle, but lasting caresses. Sometimes Libra more focus on themselves: their interest and pleasure. If Cancer feels it, then be a trouble. Therefore, a good sexual relationship in their pair is possible provided that both partners really have strong feelings for each other, and not just sympathy. Compatibility of Cancer and Libra in marriage is not high, but it is possible provided that they both want to be together. Cancers have a melancholic character and often tend to fall into the position of the sufferer, hiding in their shell and thinking about the meaning of their existence. The Libra, on the contrary, are endowed with a good sense of humor, an optimistic look and the ability to see positive even where there is none. In this regard, the air sign often helps the partner to escape from the paws of melancholy and sadness, for which he is grateful. For a while, Cancer will suffer from the fact that the air element does not give him a sense of moral intimacy. But the fact is that Libra is simply not capable of this and does not understand why this is a problem for somebody. When Cancer can understand and accept this, the relationship in the pair will immediately improve: if people are well together, then it is not necessary to swear in love to the grave. Moreover, no one knows what will happen tomorrow and whether it will be. Libra are more subject to rational, logical thinking. Compatibility Cancer with Libra in family life can also be good for the reason that they always have something to talk about. In the inner world of Cancer, something is always happening, and he is in a hurry to share it with a partner, and he, in turn, is a good listener and counselor.